We use a variety of techniques to study our objects. Non-destructive techniques — those that can be performed without altering the object — are particularly valuable to conservation scientists. Most of these take advantage of how materials interact with light. One way of categorizing light is by its wavelength. Different colors of light have different wavelengths – for example, red light has a longer wavelength than blue light. Light comes in a wide variety of wavelengths. Our eyes can detect just a tiny sliver of the rainbow of existing light – the sliver that is called, appropriately, the visible spectrum. The full rainbow of light, which extends to both shorter and longer wavelengths than what we can see, is illustrated below. The shorter the wavelength of light, the higher its energy. Different energies of light interact with materials in different ways. For example, infrared light from a heat lamp warms your skin, while ultraviolet light from a tanning bed changes the color of your skin. We’ve arranged our techniques below based on the wavelength of light that we shine on our art objects: x-ray, ultraviolet (UV), visible, and infrared (IR). These techniques help us to visualize the structure of an object and to understand its chemical composition. X-rays can move different distances through materials depending on the material’s density. A common example is in medical imaging – x-rays move easily through tissue but are absorbed by bones, creating images with contrast between the two materials. Examining artwork with x-rays reveals details below the surface that cannot be seen otherwise. Such details aid in determining vulnerabilities, discovering metal casting techniques, assessing previous conservation treatments, and identifying painting layers. Computerized tomography is a way to visualize objects in three dimensions. It’s done by taking two-dimensional x-ray images of a sample from many different angles. After all these images are collected, tomographic processing can reconstruct the three dimensional object that yielded all the different two-dimensional slices. 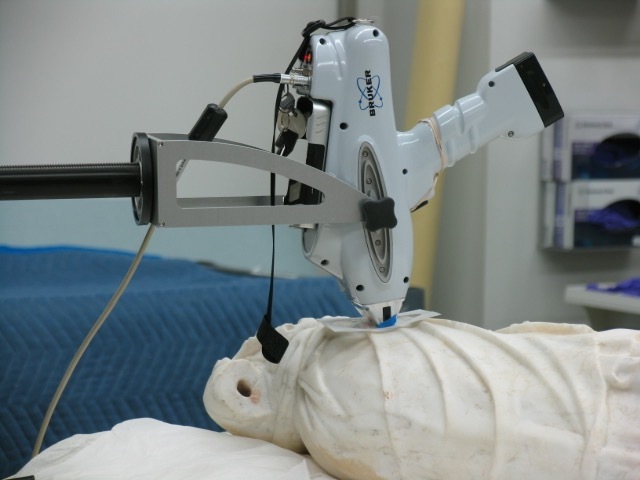 See “Finding Sellaio” for an example of CT performed on a wood panel painting. 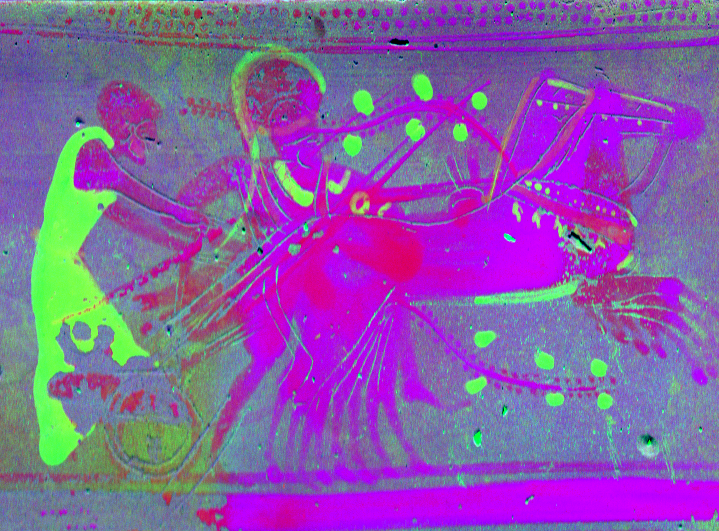 X-ray fluorescence map of an Athenian clay pot. In this map, green corresponds to calcium, red corresponds to iron, and blue corresponds to potassium. Image by Kevin Chow. X-ray fluorescence involves shooting x-rays at a sample and collecting the photons that it emits. The energy of the photons is a fingerprint of the elements in the material. For a great example of how this technique is applied to an art object, check out the “Mysterious Black” project. We use both a high-power x-ray source at the Stanford Synchotron Radiation Laboratory as well as a lower-power, handheld x-ray fluorescence detector. Handheld x-ray fluorescence measurement. Photo by Susan Roberts-Manganelli. Ultraviolet (UV) fluorescence is similar to X-ray fluorescence, except instead of shining x-rays on the sample, ultraviolet light is used instead. Organic molecules, such as those in adhesives and varnishes, often absorb ultraviolet light and re-emit a different color light. The specific color, or spectrum, of this re-emitted light can help identify the material. UV fluorescence can show where adhesives are in an object and uncover previous retouching. 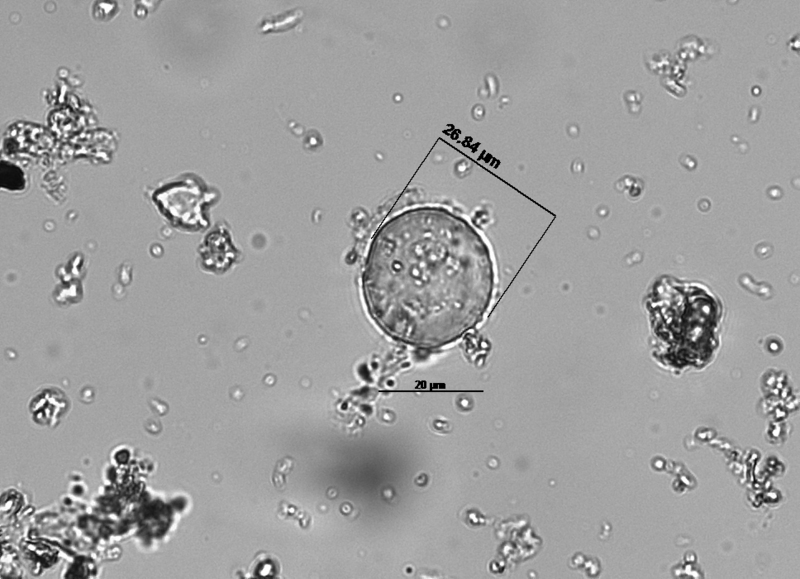 Starch grain sampled from bronze Ding vessel viewed in optical microscope. Photo by Aman Thomas. Same starch grain, viewed using cross-polarizers. Photo by Aman Thomas. Microscopes are a great way of taking a closer look at our art objects. Not only do they magnify the samples, use of polarizing filters can give us information about how fibers in the sample are aligned or to better view birefringent materials in our sample. For example, as seen above, in a study of starch grains in a bronze vessel, the birefringent starch grains stood out when viewed through cross-polarizers. 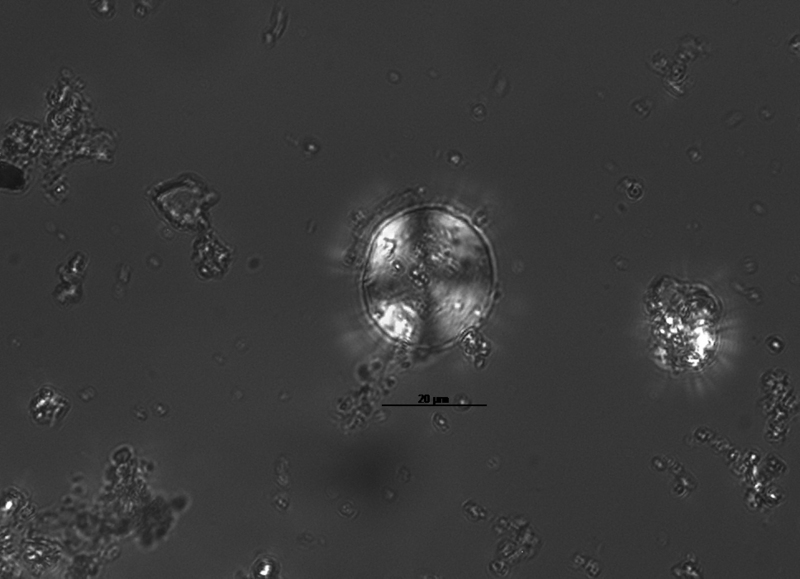 Optical microscopes use visible light, allowing researchers to directly observe the samples. Olivia and Kennedy capturing the reflectance of an ancient Egyptian portrait. Reflectance transformation imaging is a technique that maps out the surface texture of an object using light. Some texture is easy to see by eye, but small details or slight changes in thickness can sometimes be only seen very close up or from specific angles. RTI can capture how an object looks from multiple angles with high-resolution photographs. First, we take photographs of an object lit with a flash lamp from many different angles. A shiny black reference ball (seen on the right of the painting above) helps calibrate the angle of the lighting. We then use software to combine the information from all of the different images. This software (more information here) allows us to digitally re-light our object from any angle and apply filters that can let certain details pop out — the direction of paint strokes in a painting, for example, or small dents and scratches on a jar. Spectroscopy typically involves shining a broadband (multicolor) source of light at an object, then collecting the light that the object transmits, scatters, or reflects. We can obtain different information about the sample simply by changing the sample/detector configurations. Fourier Transform Infrared Spectroscopy uses infrared (longer-wavelength) light as the probe. It is often used in art conservation to identify materials in art objects such as binding media in paints, adhesives, and varnishes. When certain materials are exposed to infrared radiation, their molecules vibrate or rotate in characteristic ways that are detected by the instrument and recorded as a spectral pattern. The spectrum can then be studied and compared to other known spectra to determine the composition of an unknown material. Here’s a technique that uses electrons as a probe instead of light. In scanning electron microscopy (SEM), a narrow beam of electrons is scanned back and forth over a sample in a vacuum chamber. The electron beam interacts with the sample, ejecting electrons from its atoms. These ejected electrons are collected by a detector, and when combined with information about the beam position, giving an image of the material. SEM is especially useful for understanding the topology of the sample, and can be combined with elemental detectors in the microscope to get information about the chemical composition of the sample with high spatial resolution.